With a great vision in mind, Divers Supply was started in 1977 as a small operation in Macon, GA. Now if you know anything about Macon, it is not what anyone would consider to be a "prime location" for scuba diving, with only a few lakes and quarries in the area. Nevertheless, the "dive shop" was opened off exit 5, I-475 in Macon, Georgia. With our tremendous SCUBA training programs, dive travel, and great diving equipment deals we have been able to grow the "dive shop" into a 35,000 square foot store with a full training facility and indoor heated pool. More than 40 years later, Divers Supply has grown to enormous proportions! But it's still a hometown dive shop where you can stop and show your latest dive pictures, share stories, or talk about the "lobster that got away"! We're still family owned and run, so you can be assured of that personal touch. Divers Supply is an Authorized Dealer for every line of dive gear we carry, so you can shop with confidence knowing you are buying the best scuba gear with the full manufacturer's warranty. With over 40 years of experience, you can rest assured that Divers Supply is here to stay. Our staff are all certified divers who are willing to go that extra mile to get you the gear you need. Shopping with us for all your dive gear needs guarantees you the best price, the best service, and most importantly, the best shopping experience of your life. We offer the largest selection of the top name brand scuba equipment on the market. 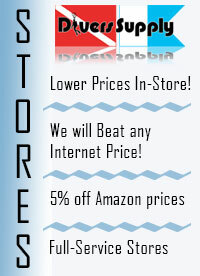 Divers Supply has 4 full retail stores, a worldwide mail-order/internet team, and a state of the art Service Department. All stores are SDI, TDI, ERDI and PADI Facilties with fully trained and certified Instructors and SCUBA divers on staff. We work with the most innovative and respected manufacturers. By buying in volume and solidifying great deals we can pass them on to you, the customer! All stores are generously stocked with over 100 quality brands of dive equipment to broaden your shopping experience. Divers Supply is committed to providing all of our customers with the best value for their dollar. If you don't see what you're looking for, please call one of our friendly divers at 1-800-999-3483. We are continually updating our website but in some cases not all products have made their debute on our website. So, if you know what you're looking for and cannot find it, give us a call. Returns or Exchanges must be completed within 60-120 days of purchase. Items must be returned in original condition as recieved. If items are returned after 60 days, or appear in used condition, they will be subject to a 15% or minimum $10 restocking fee. This is subject to change depending on the severity of damage/use to the item. Divers Supply has the right to refuse a return or exchange if it does not meet these conditions. All shipping discrepancies must be reported by the customer within 72 hours of receiving the package. To all of you, from all of us at Divers Supply - Thank you for all your support over the years!